David Cameron can take us out of Europe, but can he take Europe out of us? I was born and brought up in Kent and have lived for the past 30 years in Derbyshire. Those two places are very different but they have one rather esoteric thing in common… ritual horses. 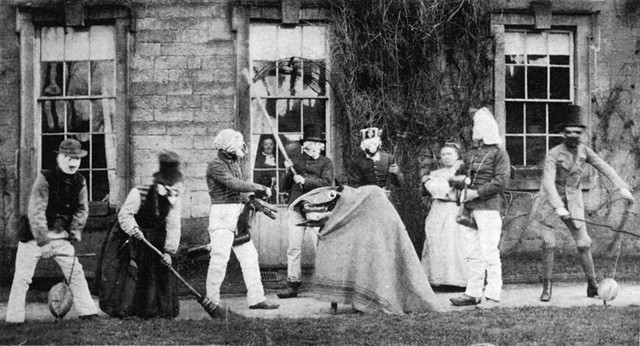 In Kent a Christmas collecting ritual involves the Hooden Horse. No-one can successfully explain what ‘hooden’ means although there are many theories and I didn’t come across them when I was young. (I left when I was 18.) 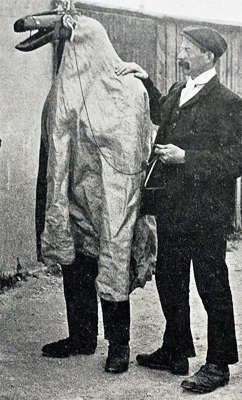 The hooden horse is what is known as a ‘mast horse’ - a head on a long pole with a cloth draped over the wearer. Hoodening is an old tradition but had almost died out and has been resurrected in the past couple of decades. Folk Festivals or any event where morris men gather are full of hooden horses these days! That’s fitting, of course, for what was one of Britain’s oldest kingdoms which still has a rearing white horse as its emblem. In Derbyshire we have both the Derby Ram and the Old ‘oss which are often interchangeable and are also part of similar Christmas/New Year collecting rituals. The ‘oss is also a mast horse and the Ram is similar but smaller. 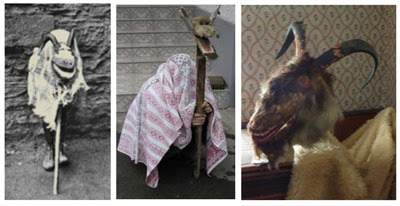 Both counties tend to think of their creature as unique and special and the hobby horse generally is often considered to be the epitome of Englishness, along with the Morris Dance. I also bought into that story 40 years ago when I first became interested in traditional songs and customs but, over the years, I have gradually realised that they are not unique to England at all—they are pan-European. At this point it would be appropriate to watch my You Tube video of the song Poor Old Horse where you will see pictures from England, Wales, Scandinavia, Romania, Poland and Russia. There is also a video of me performing the song live. I met the finest tup, sir, that ever was fed with hay. Fay lay, lay lay, folderol, older, I day. This tup was ten miles high, sir, indeed he was no more. The eagles built their nests in it, for I heard the young ones cry. And all the old women in Derby were washed away by the flood. Then the ballad went on to tell how and for what purpose people begged for his bones, eyes, teeth, hide, &c but I cannot remember more of it. However, in a version printed by Jewitt they beg for his horns to make milking pails, and for his eyes to make footballs. And a tanner begs for his hide, which is big enough "to cover all Sinfin Moor." Here we have a ballad describing the slaughter of a being of monstrous size, and the uses to which his body was put. Now when I first read the Edda, [old Scandinavian poems and myths written down in Iceland before the 13th century… ] and came to the passage which tells how the sons of Bor slew the giant Ymir, and how, when he fell, so much blood ran out of his wounds that all the race of frost-giants was drowned in it, I said to myself, " Why, that’s the “Old Tup" and when I read further on and found how they made the sea from his blood, the earth from his flesh, the rocks from his teeth, the heaven from his skull, it seemed to me that I had guessed rightly. 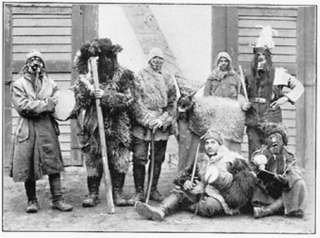 The Old Tup was the giant Ymir, and the mummers of my childhood were acting the drama of the Creation. There is a video of me singing a version of the Derby Ram HERE It was filmed for a video project. Some people cast doubt on any tradition being more than a few hundred years old and this is largely based on the fact that there are no written records. But why, when paper was expensive and time short, would you waste them in writing about a normal thing that happened every year and which everyone knew about? And/or the kind of people who did the writing would not be involved in the rites and rituals of the common folk and might not even know they happened. They definitely wouldn't have been considered noteworthy. I’m pretty sure that some of the ideas behind our modern customs (but not necessarily the custom itself) are shadows of things which happened thousands of years ago. Perhaps it sums up what it means to be European! ?